Sometimes you just don't feel like going through the motions of taking off all of your makeup. Maybe you are just too tired. It's late at night, you have been out and boy are you exhausted. Well now there is something that will help you in a pinch. MyChelle has the answer to your prayers. It is called Quick Clean Micellar Water. It is a cleanser that essentially lifts up all of your makeup, dirt and grime and whisks it away leaving fresh, clean skin. All you have to do is pour it onto a cotton pad, then wipe it on your face and voila! Clean skin. How easy is that? The micelles do all the work. This purifying cleanser gently lifts away dirt, oil and makeup in a single step. Infused with Strawberry and Kiwi Fruit Extracts, along with nourishing botanicals, it hydrates, softens and refreshes the skin. Antioxidant-rich Lotus Flower and Bamboo extracts help form a protective barrier against pollutants, irritants, and damaging free radicals. This cleanser is non-irritating. It has been dermatologist and allergy tested. Also, it is made without GMOs, gluten, parabens, petroleum, phthalates, sulfates, ureas, artificial fragrances, and artificial colors. This is a vegan and cruelty-free product. To use, saturate a cotton pad and gently wipe over face and eyes to remove all makeup and surface impurities. There is no need to rinse. However, shake well before use. Micellar cleansers are not new to the market. They have kind of taken over right now. How does MyChelle's version compare to other versions I have tried? First of all, I think it cleanses better. I noticed with the drugstore versions that they leave a little bit of makeup behind, no matter how much you try and cleanse. I was breaking out when using them. No so with this version. It cleanses better and leaves skin definitely cleaner and more refreshed. I did not break out after using the MyChelle Micellar Cleanser. Also, I like that it contains extracts of things like strawberry, kiwi, lotus flower and bamboo. These extracts are helpful additions to skincare. I like my skincare to work for me all the time. MyChelle is one of the best brands on the market today. They like to include anti-oxidants, nourishing botanicals and hydrating ingredients to help make my skin look and feel better. 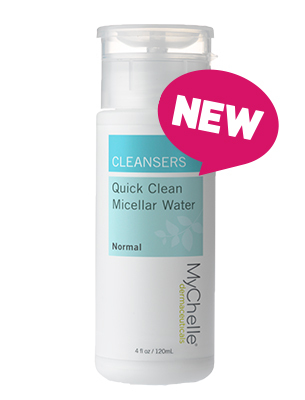 The MyChelle Quick Clean Micellar Water Cleanser is available online at www.mychelle.com and at a store near you: www.mychelle.com/Store-Locator. Like MyChelle on Facebook: https://www.facebook.com/MyChelleDermaceuticals; Follow MyChelle on Twitter: @mychelle; Follow MyChelle on Pinterest: https://www.pinterest.com/mychellebeauty/; Follow MyChelle on Instagram: https://www.instagram.com/mychellebeauty/ and Subscribe to MyChelle on YouTube: https://www.youtube.com/user/MyChelleSkinCare.